We are pleased to announce the release of HelpSmith 8.0 (which you can download from our website) that provides a redesigned Image Tool allowing you to create screenshots with various annotations, such as rectangles, balloons, arrows, lines, text labels, and also control annotations for UI elements. In addition, the new HelpSmith version provides support for clickable hotspots that you can add to any image in your documentation, and other enhancements. 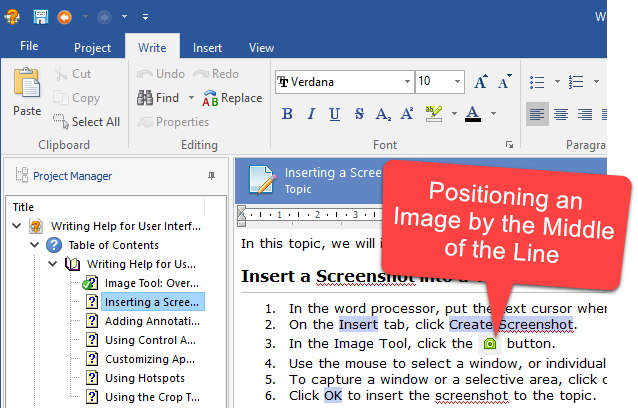 The redesigned Image Tool available in HelpSmith 8.0 allows you to create screenshots and add various annotations to an image, such as rectangles, balloons, arrows, lines, text labels, and also control annotations for user interface elements that can be exported into the topic directly. Now you can easily position and rotate annotations on an image and customize any annotation object according with your needs. For example, for an arrow object, you can select your preferred arrow shape, color, specify text, and, if necessary, setup shadow settings. 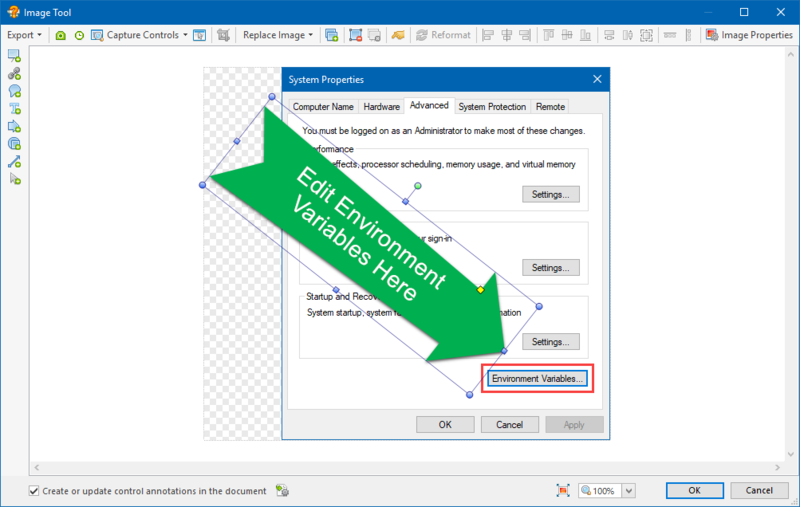 Thus, thanks to the new Image Tool capabilities, HelpSmith 8.0 makes it possible for you to create comprehensive documentation in the most efficient way! In addition to screenshot annotations, HelpSmith 8.0 adds support for hotspots that you can add to any image in your documentation. A hotspot is a clickable area on an image that works similarly to a hyperlink in a topic. Thus, you can use hotspots to link to another topic, to an external URL address, email address, or to perform a macro. It should be pointed out that the Image Tool allows you to add individual hotspot objects, or to apply hotspot settings to an existing annotation. As a result, you can easily make any annotation object like a rectangle, balloon, or text label work as a hotspot. The new Image Tool provides improved user interface that now aligns the editable image in the center of the window. Instead of using permanent borders, the Image Tool now automatically expands the image bounds by adding transparent borders if you move an annotation or another object outside of the image. For more convenience, we have added an extra toolbar in the left side, where you can select the objects available for adding to the image. Now the Image Tool allows you to rotate annotations and hotspots, and also provides new operations for easier object creation and positioning, such as Duplicate, Bring to Front/Backward, Flip Horizontal/Vertical, etc. Finally, when editing annotations for a large screenshot, the Image Tool will now work faster, thanks to optimizations for better performance! In the new HelpSmith version, we have implemented support for a vertical alignment option allowing you to specify how an image should be positioned in a paragraph line. For example, you can now easily apply Middle alignment to an icon, so it will be aligned vertically by the center of the description text. The vertical alignment option works similarly to the “vertical-align” property available in CSS. Currently, the vertical alignment option available for images is supported by HTML Help (CHM), Web Help, Printed Manual, PDF, and ePub eBook output formats. Now you can add various annotations to an image: rectangles, balloons, lines, arrows, text labels, and other objects. Added support for clickable hotspots that you can add to an image to link to another topic, to an external URL, or email address. Image Tool now allows you to rotate annotations and hotspots on a screenshot. New commands for easier object creation and positioning in the Image Tool: Duplicate, Bring to Front/Backward, Flip Horizontal/Vertical. Image Tool now properly updates annotation tables that have been moved into another parent table. Image Tool: the auto alignment and size buttons now determine position and size of the objects relative to the first selected object. Image Tool now works faster when creating and editing annotations for a large image. Shadow settings applied to an image without annotation objects now work properly. The Crop function in the Image Tool does not delete controls anymore. Added support for the Vertical Alignment option that you can use to position an image in a paragraph line. Improvements to the MS Word Import feature: the “Split by TOC” mode could not recognize outline levels in some cases. Printed Manual/PDF formats: in Outline Levels settings, you can now apply the same font that is used for heading titles, to topic titles (instead of using the font style of the #TopicTitle variable). The word processor did not recognize URL-hyperlinks pasted from an MS Word document. 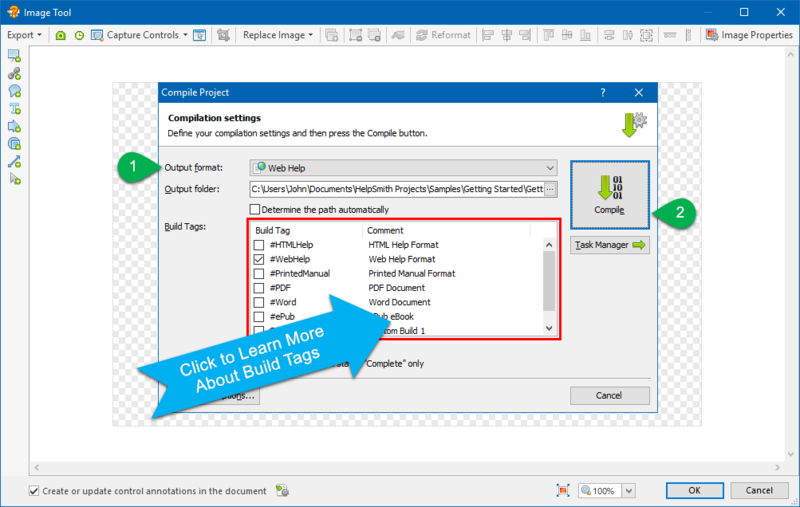 Added the possibility to select the output formats in which a template should be set as the default one directly from the Template properties dialog. Spell-checker reported a spelling error for any word that preceded or followed by a single-quote (‘) character. The #TopicTitle variable used in a template (or topic) ignored nested variables that can be inserted into an actual topic title. Icons added to the compilation log window. Web Help: topic scrolling on iOS (iPhone/iPad) now works properly. Web Help: eliminated a potential CSRF-vulnerability detected by some web scanner tools. Updated jQuery library to version 3.3.1 used in Web Help.